Jump with target and cone. A foot target/platform, a jump and a cone are placed in a line. Handler sends the dog to stop at the first target, then cues the dog to go over the jump, around the cone and return back over the jump to the handler. Purpose: Demonstrate cue discrimination at a distance. Equipment: A single jump of any safe design; handler selects height. A cone or similar object and a target/platform. Exercise set-up: The target, jump and cone, in this order, are placed in a straight line, at least 10 ft. (3 m) apart, so that the cone is at least 30 ft. (9.1 m) from where the team starts the exercise. Jump height is determined by the handler. The dog is set up in heel position 10 ft. (3 m) away from the target. The exercise begins as the dog is sent to the target, with a verbal and/or hand signal, where dog is stopped by the handler. The handler may choose to cue a specific position or allow the dog to take a default position at the target. If a specific position is cued, it will be judged. After a 1-second pause, the dog is sent with verbal and/or hand signals to continue on over the jump and then on to circle the cone. It is acceptable to cue the cone before the dog has taken the jump, but not after. The dog must proceed forwards, circle the cone and return over the jump. The handler may give an optional recall cue as the dog circles the cone. The exercise ends after the dog clears the jump on the return, at which point the handler may praise the dog. Non-qualifiers: The dog does not proceed to the target, over the jump or around the cone on the first cue. The dog does not take the jump in either direction. Dog drops the bar (if a bar jump is used). Additional cues are given beyond the ones stated within the exercise. The handler moves before the exercise ends. 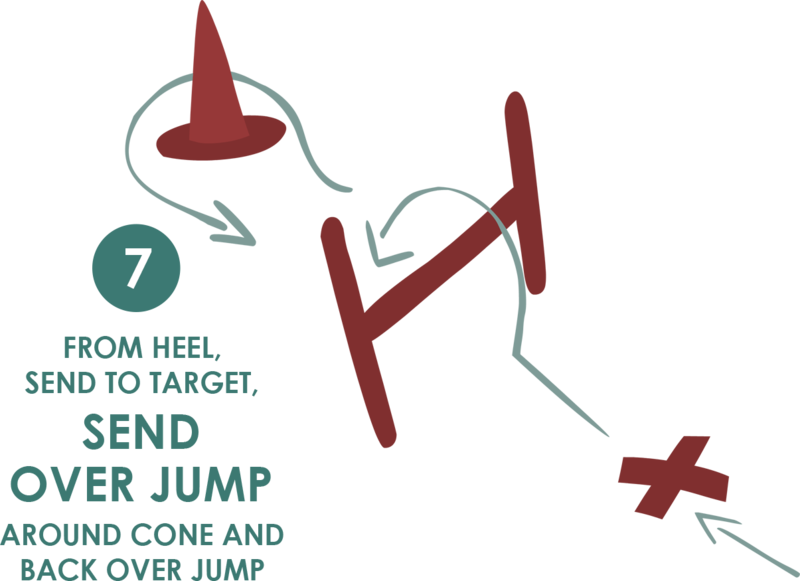 Tips: The exercise ends when the dog clears the return jump; no front is required. Go ahead and start your praise when the dog hits the ground on the way back!